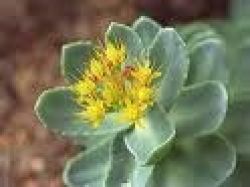 Golden Root plant, Rhodiola rosea, has the synonym Sedium rosea and is also known as Rose Root and Arctic Root. The dried roots are rose-scented and are used to stimulate the immune system. Adaptogenic properties similar to that of Siberian Ginseng. Is sometimes marketed as a cure to impotence. Traditional use of the leaves as a food. Golden Root plant is indigenous to the polar to temperate areas of North America. Europe and Asia. Prefers limey, well drained soil in an open sunny position. Drought and frost resistant. A perennial succulent, growing to 0.2m x 0.3m. Dormant and bare rooted plants of Golden Root are available for pre-order for July delivery. Be the first to review “Golden Root, plant” Click here to cancel reply.